Music emerging from self-organizing systems is the focus of the artistic practice of Kosmas Giannoutakis. He situates compositional, performative and algorithmic agencies as non-hierarchical, decentralized networks, which exchange information in multiple time-scales through the medium of sound. 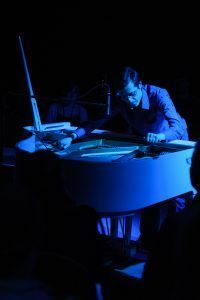 His artistic output includes experimental music forms that identify and catalyze unpredictable and unrepeatable music qualities. Kosmas’s works have been presented in various international festivals and conferences, such as inSonic and next_generation in ZKM Karlsruhe, ALIFE 2018 conference in Tokyo, Junge SIGNALE concert series in Graz, Soundislands Festival/2nd International Symposium on Sound and Interactivity in Singapore, Toronto International Electroacoustic Symposium 2016, New York City Electroacoustic Music Festival, FKL meeting in Vigevano, Gaudeamus Muziekweek 2015 and ICMC 2016 in Utrecht, REAL/UNREAL BEAST FEaST 2016 in Birmingham, klingt gut! 2016 Symposium on Sound in Hamburg, 13th Athens Digital Arts Festival, Sonic Realities 2018 in Aberdeen, Workshop-in-Exposition – Thresholds of the Algorithmic in Bergen, Linux Audio Conference 2017 in Saint-Étienne, xCoAx 2017 in Lisbon, “The Digital Body” International Exhibition in Bucharest. Born in Thessaloníki Greece, he has studied piano, percussion, composition and computer music at the University of Macedonia, University of Music FRANZ LISZT Weimar, University of Music Freiburg and the Institute of Electronic Music and Acoustics – IEM of the University of Music and Performing Arts Graz.